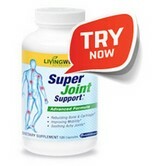 Super Joint Support - An Amazing 3-in-1 Breakthrough For PAIN-FREE JOINTS! At Last, the “Holy Trinity” Miracle for Super Fast and Everlasting Joint Pain Relief! BLESSING #3 => Actually Rebuilds HEALTHY NEW BONE - So You'll Feel Yourself Getting Younger With Each Passing Day! A brand new breakthrough – based on more than 20 clinical trials – means everyday Americans can do what was once considered impossible. They can eliminate annoying joint pain at its source… almost immediately… and keep it away forever! Before today, you faced a life sentence of never knowing when – or where – the next flash of pain would strike. Not anymore. Today I’m introducing a secret formula that gives your body a jolt of INSTANT AND PROFOUND RELIEF. To break the chain of pain, aches and misery – forever. Honestly, you’ve never had a chance to experience something so powerful… so life transforming… so DARNED MAGICAL in its ability to “turn off” pain forever. Not just mask it – but go right to the source and literally “unplug” it. Over the next few minutes, I will expose this incredible secret so you and your loved ones can experience a glorious turnaround in your own lives. Believe it or not, the stunning results I’m about to share are backed by more than 20 clinical trials performed by some of America’s top universities and research laboratories. Where did you last experience a bout of joint pain or discomfort? Your knuckles? Elbow? Knee? A troublesome back, perhaps? When it strikes, only one thing matters – getting rid of the pain – ASAP. Great news! My team of leading researchers just released an all-new joint pain-fighting formula called Super Joint Support®. It’s 100% natural and goes straight to the source of joint pain and quickly disables it. Super Joint Support® is a powerful cocktail of specially selected vitamins, nutraceuticals and 72 Ionic Sea Minerals. Each ingredient plays its part to soothe your sore body (see diagram below). A Unique 5-Pronged Attack on Crippling Pain! Arching Wrists, Knuckles and Eblows… GONE! Old, creaking Hips… SOOTHINGLY RESTORED! Painful Ankle and Heel Pain… ELIMINATED! Knotted Shoulders - plus stiff neck and back… BANISHED! Sore, Sensitive Knees… MASSAGED TO THEIR PRIOR GLORY! Together, this unique cocktail of natural pain fighters teases out the STIFFNESS from your neck… relaxes your KNOTTED-UP SHOULDERS… banishes your KNEE PAIN… soothes your ACHING HIPS… and gives much needed support to your POOR KNUCKLES. And much more, too. In fact, I was one of the unlucky ones. I suffered from chronic back and knee pain at an early age – only 22. I was a personal trainer back then, but couldn’t walk, run or exercise without suffering miserably. “ALLELUIA!” I simply could not believe how Super Joint Support® washed away my joint pain like magic. Now it’s your turn to experience sweet relief. For LIFE! I tried prescription NSAIDs just like my doctor recommended. But I was concerned about the serious side effects such as nausea, diarrhea, stomach bleeding and even kidney failure. Plus, I knew they would only mask the pain and do nothing to heal my inflamed joints and damaged cartilage. So I turned to natural joint remedies such as glucosamine and chondroitin which worked a little to ease my pain. It was excruciating. I couldn’t even sleep because of the pain. Something had to be done. So when I was given the opportunity, I challenged my team of researchers to come up with the ultimate “pain knockout” pill. It took them 11 long years, but I’m thrilled to say it’s finally here. Essential Step #1: Our Super Joint Support® proprietary formula goes straight to the source of your annoying pain and reduces joint inflammation. It doesn't mask it - it snuffs out pain wherever it finds it. Essential Step #2: Super Joint Support's exclusive formula of vitamins, nutraceuticals and 72 Ionic Sea Minerals regenerates cartilage. It’s far more effective than glucosamine and chondroitin alone (Studies show that 90% of collagen is absorbed within 6 hours.) It’s almost as if you’re putting super-absorbent “pillows” inside your knees, ankles, hips and elbows! Essential Step #3: It actually rebuilds and strengthens your bones. Yes, you read that correctly. I’m saying it REGENERATES BONE that has been damaged by years of joints grinding together and from disintegrating cartilage. You probably already know that regenerating your cartilage is vital to healing your joints. But unless you repair and strengthen the bones surrounding your joints your pain will NEVER go away completely. You are simply putting a “Band Aid” on the underlying problem. Makes sense, right? BOTTOM LINE: You need to take action on all three steps to have a chance at experiencing immediate, profound and everlasting pain relief – throughout your entire body. And as far as I know, Super Joint Support® is the only pain formula that can promise effectiveness on all three fronts – making it the world’s first “Holy Trinity Miracle” pill! Super Joint Support® is the strongest, most powerful and comprehensive joint support you’ll find today. Our advanced formula does what all other formulas fail to do – it gives you the bone-building nutrients your body craves to heal and strengthen bone. Super Joint Support® is like taking three joint health products in one – like discovering a joint replacement in a bottle! It’s not available in any store – and can only be purchased here and now. In a moment, I’ll share with you the impressive studies, trials and clinical proof behind why our world class ingredients are so effective. It was for folks like Mary and her husband – plus you and me – that I created Super Joint Support®. I wasn’t interested in a temporary fix. That’s simply not good enough. You deserve much better. So my team and I created a PERMANENT, LIFELONG SOLUTION so you say good riddance to pain… and start loving life again. For anyone who suffers the agony of pain, nothing is more important than getting rid of the pain immediately. And the best way to do that is to go the source of inflammation and “unplug” it… while simultaneously repairing cartilage and bone for long-term pain relief. In 400 BC, Hippocrates, the great physician of Ancient Greece, advised his patients to chew on the bark of the white willow tree to reduce pain and inflammation. Why? The bark contains a chemical known as salicin, whose pain-relieving properties are similar to aspirin. But unlike aspirin alone, white willow bark also contains powerful plant compounds called flavonoids and polyphenols which reduce inflammation. Modern studies suggest white willow bark is as effective as aspirin in reducing pain and inflammation, but at much lower doses. A 2001 study published in the journal Rheumatology found in a group of nearly 200 people with low back pain, those who received willow bark showed a significant improvement in pain compared to those who received a placebo. And in two double-blind studies, one group of patients with knee and hip joint pain were given white willow bark daily for 2 weeks. The other group was given a placebo. Those taking the white willow bark showed a significant reduction in pain. An excellent start, right? But we went much further. To further relieve pain, we also added an organic sulfur called MSM to our Super Joint Support® miracle pill. MSM is the abbreviation for methylsulfonylmethane. You can find it in many foods, such as broccoli, legumes and milk. Your body needs this all-natural sulfur to build and repair healthy joint cartilage. Plus, it naturally relieves the inflammation in your joints for quick pain relief. In clinical trials on MSM, it’s been found to be an effective pain reliever. For instance, a double-blind study by the International Journal of Anti-Aging Medicine found those who took MSM reported 82% improvement in pain relief. This amazing news is based on double-blind, placebo controlled studies - the absolute gold standard of medical research. "MSM is important in joint health and helps from the connective tissues including cartilage, tendons, and ligaments. It may also reduce pain by slowing the nerve impulses that transmit pain signals." Alpha Lipoic Acid, or ALA, is a mainstay in natural medicine for the treatment of nerve pain. This antioxidant also protects your cells from damage and works as an anti-inflammatory - one of the underlying causes of joint pain. Very few natural substances specifically address nerve pain, but ALA is able to do just that. A study on ALA out of the University of Siena, in Italy, found that the nutrient can help treat general lower back pain symptoms, regardless of their cause. A group of outpatients with lower back pain lasting longer than 12 weeks were given daily doses of ALA – with a high degree of success. Now that I’ve shared this potent blend of miraculous pain-erasing nutrients, you might be wondering how they work. Between every joint in your body is a soft, spongy connective tissue called cartilage. It’s there to cushion and protect your joints. Cartilage protects your bones from the wear and tear of everyday movement. When cartilage breaks down you suffer joint stiffness and pain. And without cartilage, you’d have bone grinding on bone. Ouch! Cartilage is a living substance inside your body. As such, it needs to be cared for and nourished. And the really good news about cartilage is that it can be regenerated – naturally! So to help you rebuild your joints – and ease your joint discomfort – I have included the most natural and more effective form of glucosamine sulfate. Glucosamine sulfate rebuilds cartilage and increases the thick fluid that surrounds your joints, called synovial fluid. Just like you put oil on a sticky door knob so it turns smoother and faster, the synovial fluid lubricates your joints so they move smoothly, too. Now, it’s true many other pain formulas use glucosamine. But are they using the pure sulfate form proven in laboratory studies to be more effective at rebuilding cartilage and nourishing your joints? I’ll bet the answer is no. As I said earlier, your body needs sulfate to build new healthy cartilage. That’s why we use the glucosamine sulfate since it’s more effective. Plus, we added chondroitin sulfate. Leading research has found that when chondroitin is in the “sulfate” form, it’s more effective. And here’s really good news… when you combine chondroitin sulfate with glucosamine sulfate – the results are even better! In a clinical study published in the New England Journal of Medicine, 1,583 patients with knee pain were tested. Of the group with moderate to severe pain that took BOTH the glucosamine and the chondroitin sulfate, 80% had significant improvement. You might think these superior ingredients are good enough for one pain supplement, right? Wrong! We’ve also added a superior form of collagen – the main ingredient in healthy joint cartilage. Collagen is the most abundant protein in your body. You’ll find it in fibrous tissues such as ligaments and tendons. These connective tissues in your joints are made of collagen. It’s also found in cartilage and bone. Some have called it, “the glue that holds your body together.” But as you age, your body’s supply of collagen decreases and cartilage thins and breaks down. As a result, chronic dull burning pain and stiffness settle in to your joints. And your joints deteriorate, lose their flexibility and unleash more searing pain with every little movement. By adding collagen back into your body, your body can replace damaged cartilage with new healthy tissue to rebuild your joint from the inside out – restoring your mobility and flexibility and banishing joint pain forever. FACT: An Amazing 37% of Super Joint Support® Users Reported Feeling an Improvement in Less Than 2 Weeks… AND 14.7% Said They Enjoyed Pain Relief in 1 week or Less! So remember this: Your joint pain supplement MUST have collagen to replace what you’ve lost through the years. But not just any collagen will do. Super Joint Support® contains the most effective and comprehensive collagen II available. It’s called Hydrolysate Collagen type II. This remarkable nutrient supports healthy joint function by rebuilding cartilage and replenishing the lubricating synovial fluid your joints need for flexibility and motion. It’s a patented collagen that naturally contains Hydrolysate Type II Oral Collagen, chondroitin sulfate and hyaluronic acid that work together in synergy to do what other collagens simply can’t. For one thing… what makes Hydrolysate Collagen type II so powerful at rebuilding cartilage is its Higher Molecular Weight. The higher molecular weight makes it optimal for absorption. This means that this super collagen can get into every tiny nook and cranny in your joints to quickly start building new collagen and healing joints. The extraction process that uses both water and enzymes preserves the important nutrients in Hydrolysate Collagen type II yielding a higher molecular weight for optimum absorption, much better than regular collagen! Other collagen molecules are simply too big for your body to absorb everywhere collagen is needed. Next, cartilage is made up of cells called chondrocytes. Chondrocytes help to nourish the cartilage. And when cartilage is damaged from wear and tear or age, chondrocytes replace the damaged cartilage. But sometimes when we age, the chondrocytes become sluggish and can’t repair your cartilage. Your knees go stiff. Your hips can’t bend. Your fingers don’t move. But here comes Hydrolysate Collagen type II to the rescue. The Type II Oral Collagen actually stimulates the chondrocytes to make new cartilage. And since it's 100% cold water soluble, 90% of the collagen is absorbed with in 6 hours, so chondrocytes move faster than ever to repair your damaged cartilage. Researchers have been studying Type II Oral Collagen for over a decade in more than 20 clinical trials and the results are nothing short of amazing. In one 30 day clinical trial, 20 patients suffering with various joint problems were given Hydrolysate Collagen type II every day. The result: 80 out of 89 experienced reduction in joint discomfort. In another study, they found that Hydrolysate Collagen type II led to a 40% improvement in joint discomfort. In still another trial, the Hydrolysate Collagen type II group experienced significant improvement in physical activities compared to the placebo group. The list goes on. Super Joint Support® contains 500mg of Hydrolysate Collagen type II, along with 300mg of Hydrolysate collagen, 50mg of HA and 100mg chondroitin sulfate. Which Pain Relief Formula is the REAL DEAL? And instead take an ALL-IN-ONE pain relief solution that can restore your healthy joints and offer you pain-free living? THE STRAIGHT TRUTH: 63.8% of our customers would recommend Super Joint Support® to their family and friends. STEP 1: Super Joint Support® relieves the throbbing pain and inflammation that hits you every day. STEP 2: Super Joint Support® rebuilds damaged cartilage to restore joints to youthful mobility. STEP 3: Super Joint Support® is literally jam-packed with vitamins and minerals to build and maintain healthy, steel-strong bones. Please understand, it’s NOT a quick fix. This remarkable Holy Trinity formula offers the promise of long-term, even PERMANENT pain relief. Simply use as directed for optimal results. Vitamin D is often called the “sunshine” vitamin. That’s because spending as little as 10 minutes a day in the sun can help your body synthesize the vitamin D it needs. But that’s difficult to do – especially in colder climates or if you use sunscreen. But getting enough Vitamin D is vital to keeping your bones strong and healthy as you age. That’s because vitamin D boosts your body’s ability to absorb bone-building calcium straight from the foods you eat. If you don’t get enough vitamin D, you can suffer from bone loss or your bones become brittle and break easily. Super Joint Support® gives you 950 IUs – the full recommended dosage of vitamin D so your bones stay strong. Vitamin K2 is needed for healthy new bone formation. Your body uses osteoblast cells to build healthy new bone to replace the bone mass you lose. To do this, osteoblasts use a protein called osteocalcin which attracts and anchors calcium into your bones. Vitamin K turns on the bone–building osteocalcin to get busy building new bones. A study out of Japan showed that combining Vitamin K2 with Vitamin D increased bone mass significantly better than taking Vitamin K and Vitamin D alone - in as little as 6 months. Vitamin B12 makes sure your body maintains the proper levels of an amino acid called homocysteine. Why is this important? If you have too much homocysteine, it can build up in your bones – preventing the collagen from building strong new bones. Your body builds weak, brittle bones instead. Vitamin B12 keeps your homocysteine levels in check so your body can build healthy bones. You have probably heard of these vitamins before. Now you know how great they are for repairing and maintaining strong healthy bones. But this next ingredient is truly at the heart of our Step 3 solution to lifelong bone health… and eternal freedom from pain. But you won’t find it anywhere else. It’s so rare and exotic that no other formula uses it. Big Mistake! In fact, Super Joint Support® is the ONLY joint health product available that includes this remarkable healing gift from the sea..
Minerals are the basic elements of life. They are found in everything on earth, including you. Think of the everyday minerals you may know… calcium for your bones… iron for your blood… boron to metabolize calcium… and so many more. Your bones need these trace minerals as raw material to build healthy, stronger bones to replace the bone mass we lose as we age. We call them trace minerals because you only need very small amounts to keep your bones and body healthy. Plus, healthy levels of minerals keep your body in proper pH balance which is so important for maintaining strong bones. For example, if your body becomes too acidic, it will strip your joints of moisture to rebalance pH. This leads to joint pain. Your body will also steal calcium and other minerals from your bones to restore pH balance. This theft leads to brittle, breakable bones… and a lifetime of pain. Yet research indicates 95% of us are woefully deficient in at least one mineral, and most likely, a host of trace minerals. These trace minerals used to be abundant in soil, but sadly no more. So where can you find them today? Ancient Ionic Sea Minerals contain a unique trace mineral found from the sea. The minerals are at trace quantities and are insignificant alone, but within a multi-mineral matrix they work synergistically and give a powerful boost to the action of the calcium and magnesium. All the extraordinary ingredients in Super Joint Support® I shared with you would already give you the strongest, most effective joint health solution on the market today. But by adding Ancient Ionic Sea Minerals – A truly one of a kind blend of 72 of the most powerful all-natural trace minerals in the world… well, that truly puts the “super” in our Super Joint Support® formula. Calcium – For healthy teeth and bones! Also helps regulate nerve function. Magnesium – helps relax muscles and stimulate enzyme production! Also promotes healthy bowel function. Manganese – promotes healthy bone formation… supports growth of healthy connective tissue… and boosts calcium absorption! Boron – helps metabolize calcium and magnesium; critical for healthy membrane function. Phosphorous – helps repair damaged cells and promotes healthy new cell growth! Iron – to transport oxygen to the cells in your body! Zinc – to boost white blood cell production in your immune system! Potassium – a natural pain desensitizer! Helps ease headaches and migraines and promotes faster healing of injuries. Copper – Essential for healthy function of proteins and enzymes! Also aids in the absorption of iron. Selenium – Powerful antioxidant! Helps vitamin E protect cells and connective tissue by destroying free radicals! Alfalfa leaf – has a strong alkaline effect on the body! Also a natural laxative and diuretic that helps detoxify the body – especially the liver! Plus 61 more powerful trace minerals! Do you remember your last beach vacation? How wonderful it was to dip in the salty ocean waves? How great your body started to feel – like it had been renewed? Well my friend, the scientific reason you feel so great at the beach is because your body is getting a taste of the rich minerals hidden in the salt water. Remember, the Ancient Ionic Sea Minerals you find in Super Joint Support® have 8 to 10 times the concentration of minerals you’ll find in other products. The mineral health benefits in Super Joint Support® are like spending a week at the beach – without the sunburn. Finally, Joint Pain and Stiffness are Gone! You’ll be able to bend down and pick up a pen without a lightning bolt of pain. You can enjoy a sunny day by taking the dog for a vigorous walk around the block. You’ll rediscover the mobility to work and play like you did 30 years ago. Plus you’ll sleep like a baby the whole night through because your joints are soothed, nourished and refreshed. You will feel better, more alive, than ever. When pain is banished and you can move with ease and comfort, your life improves dramatically. You’ll want others to know about the relief you’ve experienced thanks to Super Joint Support®. With pleasure I am sending you this message. It has been over a year that I have been taking the "Super Joint Support®". As you can imagine, at first I was skeptical, as you know there are a lot of products in the market claiming to be, the “Miracle” in a bottle. Happy to report that 90% of joint pain is no longer part of this body, not sure how I would function daily. As My 'Thank You' Gift. With Super Joint Support's unique 3-step 'Holy Trinity' formula to eliminate your pain forever, it's like getting three amazing joint products in one for complete joint health. Remember, you get 14 joint-healing nutrients working together to attack pain at its source… trigger cartilage regrowth… and build strong new bone. All in one formula - for just pennies a day! This best-selling book reveals the amazing, all-natural 30-day action plan you can start immediately to eliminate joint pain and actually REVERSE your osteoarthritis and rheumatoid arthritis. Dr. Wiley explains in vivid detail how to enjoy the maximum benefits from his groundbreaking 30-day action plan…so you can live the active, pain-free life you deserve. You’ll be stunned at how simple and easily adaptable the plan is to your life. The scary truth behind prescription pain drugs. What your doctor is NOT telling you about side effects…and why your pain always comes back! The 10 most common arthritis mistakes that are keeping you from total pain relief. Watch out – making just one could lead to a lifetime of pain. The hidden cause of joint inflammation and pain. Get rid of it and end your suffering once and for all. How to soothe inflamed joints by avoiding certain foods. Plus, 10 foods to start eating now for arthritis pain relief. Simple kitchen cures for joint pain. Pain-curing secrets of everyday exercises. Here are 4 stress-free exercises to start you moving and your joints healing. Just 20 minutes a day to a pain-free life. The secret link between stress and arthritis. 10 ways to reduce stress naturally and reduce pain and inflammation. If you're sick and tired of constant joint stiffness and pain, you'll want to get your hands on this must-have book. Fortunately, you can instantly download your copy of Arthritis Reversed when you place your order. Remember, this book is yours FREE. Would you like to save an extra $10 and make sure you have enough Super Joint Support® on hand for 90 full days? Then I suggest you order a 3-month supply of Super Joint Support®. You pay only $167, plus shipping and handling. Dr. Mark Wiley has spent a lifetime developing his powerful pain relief and healing model. Over 3,000 people have used Dr. Wiley’s model to reduce and even eliminate chronic pain. Now he’s making his breakthrough pain healing process, called the Wiley Model, available to you. This method is unlike any healing system in the world. It provides a revolutionary means of preventing – and even ELIMINATING – chronic pain…illness… and disease. You can be a fly on the wall as Dr. Wiley and I discuss his plan in detail. You’ll discover the simple, all-natural steps you can do to eliminate pain from your life. If you want to be free of the nightmare of constant pain and maintain healthy joints for the long run – plus save the most money you can – then order a 6-month supply of Super Joint Support®. This is by far the best deal. You pay just $299, plus you get FREE shipping and handling. In addition to your FREE shipping and handling, you also SAVE $55 off the regular price. That reduces the price to just 28 cents per joint support capsule. What a small price to pay to restore mobility and flexibility to your life. What would you give to dance again? To run around with your grandchildren again? To ski, swim or cycle again? To get down on your knees, dig in the soil and get your garden back to its glory days? Or to simply live pain-free forever? There’s no reason for you or a loved one to spend another minute suffering from joint pain. In this NEW special report, you’ll discover the six reasons arthritis may be stalking you… and what you can do to reduce your risk. Plus, you’ll discover FIVE little-known yet soothing 100% NATURAL remedies clinically proven to heal, ease pain and reduce inflammation – without taking drugs or suffering any side effects. And here’s a bonus. These all-natural secrets work for both osteoarthritis and rheumatoid arthritis. But hurry. All three gifts are yours FREE today only when you order a six-month supply of Super Joint Support®. That’s a combined value of $403.85 for only $299 – a total savings of $104.85! All three gifts are yours FREE only when you order a six-month supply of Super Joint Support®. That’s a combined value of $403.85 for only $299 – a total savings of $104.85! Relax There is ZERO RISK! You are Protected by My Ironclad 90-DAY Money-Back Guarantee! I know from personal experience how powerful Super Joint Support® is, and I fully stand by this amazing product. That’s why I’m offering an unconditional, 100% money back guarantee. You risk nothing. Simply try Super Joint Support® and if you don’t agree it’s the best supplement you’ve ever tried for your joint problems, simply send back the empty bottle/s and unused portions and we’ll refund your entire purchase price (excluding shipping and handling). How’s that for a square deal? For single bottle orders: If you don't feel significant improvement after trying Super Joint Support® for at least 2 weeks, simply return the used bottle and we'll gladly refund your purchase price (excluding shipping). I’m assuming all the risk. I can’t think of a better way to convince you to try this breakthrough in joint pain, cartilage rejuvenation and bone healing. Plus, your FREE Special Gifts are yours to keep – no matter what you decide later on! Finally Break Free from Pain - for LIFE? Are you ready to seize the day and feel 20 years younger? Are you itching to work in the garden, give your grandchildren piggyback rides, dance with your spouse, play tennis, golf and swim… to do anything you want? Now is the time to say “No More!” to waking up with annoying aches and pain. Instead, you’ll feel refreshed with bundles of energy and joy to face the day. And best yet, no more slathering on smelly pain lotions or taking harmful pain medications. Instead, you can get back to the comfortable, active lifestyle you’ve been missing. Since you risk absolutely nothing with our 90-Day Money-Back Guarantee, why not order today? To get rid of your pain forever, repair your joints and enjoy life again, simply choose your Best Deal below or call 1-800-216-4908 right now. You’ll be glad you did. Let me ask you: What will you do first once your joints no longer ache and prevent you from living life fully? With Super Joint Support®, here’s your chance to SEIZE CONTROL OF YOUR LIFE – once and for all. So do it – while you’re thinking of it! "IF IT WORKED FOR ME, IMAGINE WHAT IT CAN DO FOR YOU!" P.S. Here’s my promise: Super Joint Support® will work for you or it’s FREE! If you haven’t achieved the pain-relieving results you’ve been searching for within 90 days, then we’ll return every penny of your purchase price. There’s no risk to you. I simply want you to give Super Joint Support® a try. So order now. You can call toll-free at 1-800-216-4908 right now. Q: How Many capsules of Super Joint Support® should I take daily? A: The suggested daily and maximum dose of Super Joint Support® for optimal benefit is 4 capsules per day. Take 2 capsules in the morning with breakfast and 2 capsules in the evening with dinner. Q: How many capsules are in each bottle? A: Each bottle of Super Joint Support® contains 120 capsules. Each bottle contains a one month (30 day) supply at the suggested dose of 4 capsules per day. Q: How long should I continue to use Super Joint Support®? A: Super Joint Support® was formulated to be taken daily and tolerated well with long term use. Some individuals will find comfort very quickly while the result for others will depend on the severity of one's own condition. We suggest taking Super Joint Support® daily while symptoms are present to maintain optimal joint function. Q: Can I take Super Joint Support® with food? A: Yes, we recommend you take Super Joint Support® with food. Q: Is Super Joint Support® a vegetarian supplement? A: No, Super Joint Support® is not suitable for vegetarians. Q: Is Super Joint Support® gluten free? A: Yes, Super Joint Support® is Gluten Free, as well as free of Milk, Soy, Wheat, Nuts, Egg and Yeast. Q: I cannot swallow capsules. Can the capsule be opened up and put in to apple sauce or other foods? A: Yes, you can open the capsule and mix with apple sauce or any food you like. Q: Do I really need to drink 8oz of water with Super Joint Support®? A: Yes. In fact, it is the most important aspect of taking any supplement. We suggest that you take Super Joint Support® with 8 oz of water and then 15 minutes later, drink an additional 8oz of water. This ensures the nutrients are in solution and are flushed into your small intestine for optimal absorption. Q: Can I take Super Joint Support® if I take other supplements? A: Yes! There are no known contraindications between Super Joint Support® and any other supplement. In fact, we recommend a balanced supplement protocol including the use of a good Proteolytic Systemic Enzyme formula to help clean out any metabolic waste in the joints which allows Super Joint Support® to work even better. The Proteolytic Systemic Enzyme formula we support is Heal-n-Soothe®, as it has the highest Enzyme potency available in any brand. Q: I'm in my 70s and I'm concerned about my joints. Is it too late to start taking Super Joint Support®? A: Not at all! It's never too late to support your body and joints. Q: Can I purchase Super Joint Support® at my local health food store? A: No, Super Joint Support® is only offered by the Healthy Back Institute® and its affiliates. Q: Can I take Super Joint Support® with my other medications? A: Individuals taking any medication should consult a physician prior to taking Super Joint Support®. If you do get clearance to take other medications it is recommended that you wait at least 60 minutes after taking Advanced Joint Support before taking those medications. Q: Who should not take Super Joint Support®? - This product contains Crab Shell, do not take if you are allergic to shell fish. - Stop taking this product 2 weeks before any scheduled surgery. - This product is not intended for individuals under the age of 18. - Do not take this product if you know or suspect that you are allergic to any ingredients. - As with all dietary supplements, those who are pregnant or nursing should consult their physician. Q: I’ve tried other joint health products. How do I know for sure that Super Joint Support® will work for me? A: To be honest, you don’t. Not for sure. Everyone’s body is different and what works for one person may not work for another. We have formulated Super Joint Support® with the best and most effective combination of nutrients to support your joints in 3 ways. First, to relieve pain quickly. Second, to regrow the soft cartilage that gently cushions your joints. But Super Joint Support® goes one step further. We’ve added nutrients to our formula to help strengthen and rebuild your bones. No other joint support formula does all three. It’s like getting three joint support products in one. But the only way to know for sure if it’ll work for you is to try it. If it’s not the best joint support formula you’ve ever tried, simply return the empty bottles or unused portion and we’ll send you a full refund (excluding shipping and handling). Q: How do I order Super Joint Support®? A: Simply click the ADD TO CART button below or call 1-800-216-4908 toll-free 24 hours a day. Outside the U.S. call 1-240-780-5977. What follows is sad. But our legal team insisted we must treat you like a "kid" and tell you:"Do not take this product if you know or suspect that you are allergic to any ingredients in this product (specifically, this product contains Crab Shell so do not take if you are allergic to shellfish). Stop taking two (2) weeks before scheduled surgery. As with all dietary supplements, persons 18 years and under, on antibiotics, or who suffer from medical conditions, or who are taking medications, or are pregnant, or nursing should consult with their physician prior to taking this product." – kind of "common sense", right? Any level headed person surely already knows that. 3) provides minerals and nutrients bones need to grow. Chrubasik S et al. "Treatment of low back pain exacerbations with willow bark extract: a randomized double-blind study." American Journal of Medicine. 109.1 (2000):9-14. Daniel O. Clegg, M.D., Domenic J. Reda, Ph.D., Crystal L. Harris, Pharm.D., et al. Glucosamine, Chondroitin Sulfate, and the Two in Combination for Painful Knee Osteoarthritis. N Engl J Med. 2006 Feb 23;354(8):795-808. Gupta RC, Canerdy TD, Skaggs P, et al. Therapeutic efficacy of undenatured type-II collagen (UC-II) in comparison to glucosamine and chondroitin in arthritic horses. J Vet Pharmacol Ther. 2009 Dec;32(6):577-84. D'Altilio M, Peal A, Alvey M, et al. Therapeutic efficacy and safety of undenatured type II collagen singly or in combination with glucosamine and chondroitin in arthritic dogs. Toxicol Mech Methods. 2007;17(4):189-96. Crowley DC, Lau FC, Sharma P, et al. Safety and efficacy of undenatured type II collagen in the treatment of osteoarthritis of the knee: a clinical trial. Int J Med Sci. 2009;6(6):312-21. Greene GW, Banquy X, Lee DW, Lowrey DD, Yu J, Israelachvili JN. Adaptive mechanically controlled lubrication mechanism found in articular joints. Proc Natl Acad Sci U S A. 2011 Mar 29;108(13):5255-9. Li NG, Shi ZH, Tang YP, et al. New hope for the treatment of osteoarthritis through selective inhibition of MMP-13. Curr Med Chem. 2011;18(7):977-1001. Campo GM, Avenoso A, Nastasi G, et al. Hyaluronan reduces inflammation in experimental arthritis by modulating TLR-2 and TLR-4 cartilage expression. Biochim Biophys Acta. 2011 Sep;1812(9):1170-81. Bikadi Z, Hazai E, Zsila F, Lockwood SF. Molecular modeling of non-covalent binding of homochiral (3S,3'S)-astaxanthin to matrix metalloproteinase-13 (MMP-13). Bioorg Med Chem. 2006 Aug 15;14(16):5451-8. Huang SL, Ling PX, Zhang TM. Oral absorption of hyaluronic acid and phospholipids complexes in rats. World J Gastroenterol. 2007 Feb 14;13(6):945-9. William, Judy, “Clinical study shows hyaluronic acid in BioCell Collagen® found to have significant absorption and bioavailability,” SIBR, February 2,2004. Largo, R. et al… 2000, Inflammation Research Unit, Fundacion Jimenez Diaz, Autonoma University, Madrid Spain. Not Sure You Want Super Joint Support?